Mad About Plaid Cookie Exchange and Plaid Sugar Cookies - Home. Made. Interest. 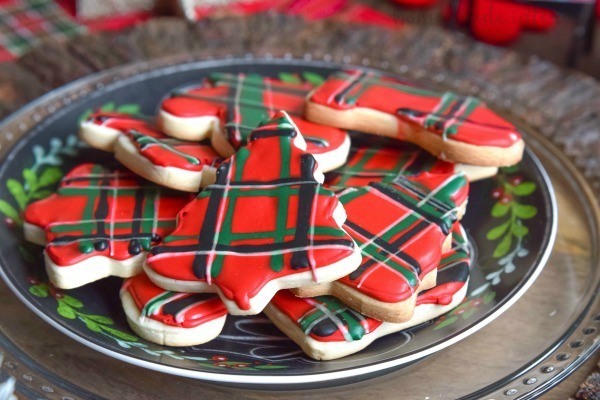 We are Mad About Plaid this year and we turned that into the theme for our Christmas cookie exchange! It’s Christmas cookie season and that means cookie exchange parties! I am so excited about this year’s party because the theme is Mad About Plaid. I’ve been so into plaid this season. I love the traditional colors and there is just something about plaid that makes you feel warm and cozy. I’m not the only one loving plaid this year, every store seems to be stocked with cute plaid holiday decor that is just calling my name. 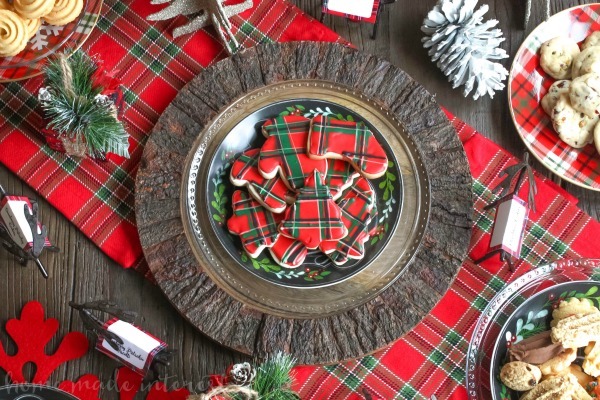 My husband says I might have a problem…I’ve decked out my mantel and my Christmas tree and when it came time to host my yearly cookie exchange I knew it was the perfect excuse to decorate a beautiful plaid table so the theme was Mad About Plaid! 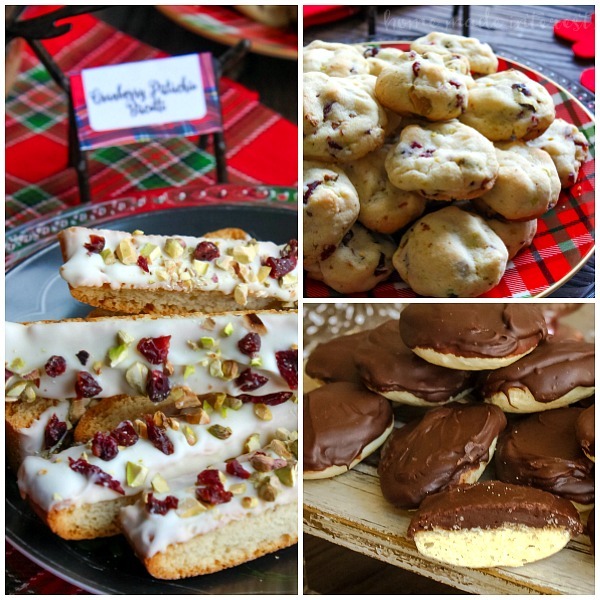 One of the most important parts of a cookie swap is the exchange of cookies and their recipes. 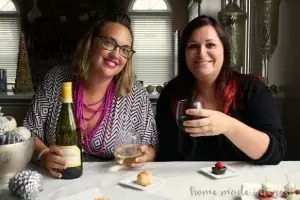 Usually everyone has to write out multiple copies of their recipes and at the party each guest receives recipe cards and a sample of each cooking. This time around I wanted to do things a little differently. Instead of having everyone write out their own recipe cards that they had to bring along with them I had my friends and family send me their recipes and I printed them out on custom labels that perfectly fit the top of Rubbermaid TakeAlongs . All my guests had to do was bring once big container of cookies and during the party everyone could pack up a sample of each cookie in Rubbermaid TakeAlongs, and attach the recipe card right to the lids so they could easily find them when they got home. 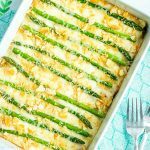 It worked out so well that I wanted to share my printable with you! DOWNLOAD HERE. 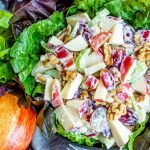 Whether you are hosting or attending a cookie exchange these make sharing your recipe super easy. Rubbermaid TakeAlongs are the perfect way to store your cookies because they have a Quik Clik Seal™ that helps to keeps food secure, and prevent spills on the car ride home. They are also microwavable, top rack dishwasher and freezer safe. Being freezer safe comes in pretty handy when you go home with a few dozen cookies. Not to mention when you have to cook several dozen cookies! 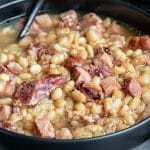 I made mine ahead of time and stored them in large Rubbermaid TakeAlongs in my freezer until it was party day. 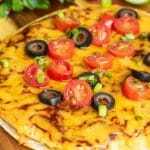 You can find them in Walmart and they work just as well for all of those holiday leftovers so grab some next time you’re there. I had so much fun decorating for this party I don’t even know where to begin. I guess we should start with the first thing that went on the table, the plaid table runner. It’s not really a table runner it’s actually three plaid placemats layered together. There isn’t really a need to run out and buy a ton of new decor for a party. I usually buy one or two new pieces and use things I already have for the rest of my decor. Three placemats together worked just fine for a runner and if you don’t have placemats you could even use a plaid scarf or a yard or two of fabric. I chose to only use a runner instead of a tablecloth because I found these beautiful plaid plates and they would have been lost sitting on a plaid background. 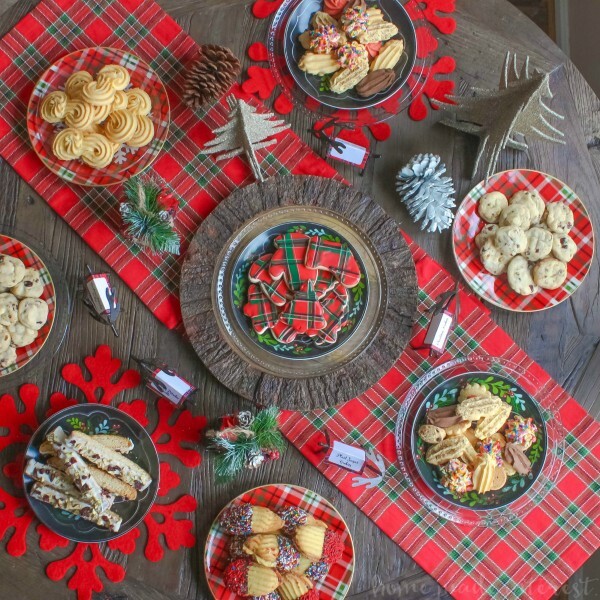 Since a cookie exchange is all about lots and lots of cookies I needed plenty of platters so I used a mix of plaid dinner plates and other holiday plates and spread them out around the table. Each guest loaded a plate up with the cookies they brought and once the party got started we all got to try some of each. 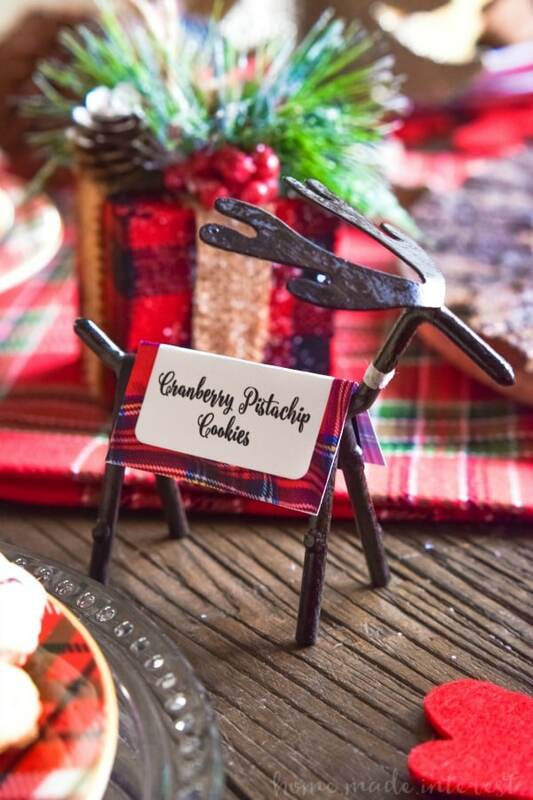 I made it easy for everyone to find a plate for their cookies with these cute reindeer place cards. Instead of labeling them with each person’s name I wrote the name of their cookie. I even made a cute printable template for place cards that you can DOWNLOAD HERE. I happened to have these reindeer place card holders but you could use place card holders you already own, buy Christmas themed place card holders, or just download my template, fill in the name of the cookies and fold the place cards over and sit them on the table next to each plate. It all works! In the center of the table I used this totally awesome wood charger. it covered the places where the placemats over lapped and it made a perfect centerpiece for my cookies! I love the rustic wood look with the traditional red plaid. It had that classic Christmas feel. Speaking of my cookies…you know if I was this excited about plaid I couldn’t pass up the chance to make matching cookies, right? I made basic sugar cookies and royal icing using my favorite sugar cookie recipe and royal icing recipe . Then I cut them out into mittens, stockings, and Christmas trees and went to town decorating them in a red, black and green plaid pattern. I’m not going to lie, it took a little bit of time but, it was totally worth it. They turned out so pretty people almost didn’t want to eat them…until the first bite. Then they couldn’t stop! The technique is pretty simple. You start by outlining the cookie in red royal icing. Once the outline has firmed up you flood the cookie without a layer of red icing. This icing should have a bit more water added to it so that as you spread it over the cookie you any lines, or marks disappear as the icing spreads out on it’s own. Using black, green and white icing that is the same consistency you start drawing lines and creating a plaid pattern. The icing lines will meld into the red icing so when it dried you have a flat surface. 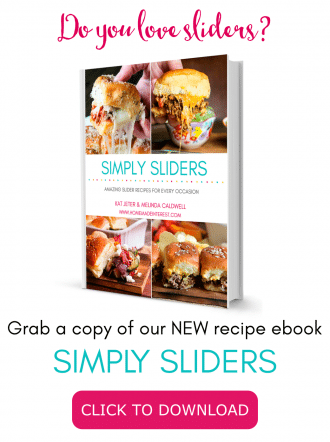 It’s not hard but it takes a little practice to get your different icing consistencies right. I’m by no means an expert so my suggestion is to read some tutorials and watch some videos. You’ll get the hang of it in no time! I hope our Mad for Plaid Party has got your creative juices flowing. If you’re hosting a cookie exchange this year, or attending one, or just baking a bunch of cookies we would love to hear some of your favorite recipes! Let us know in the comments. 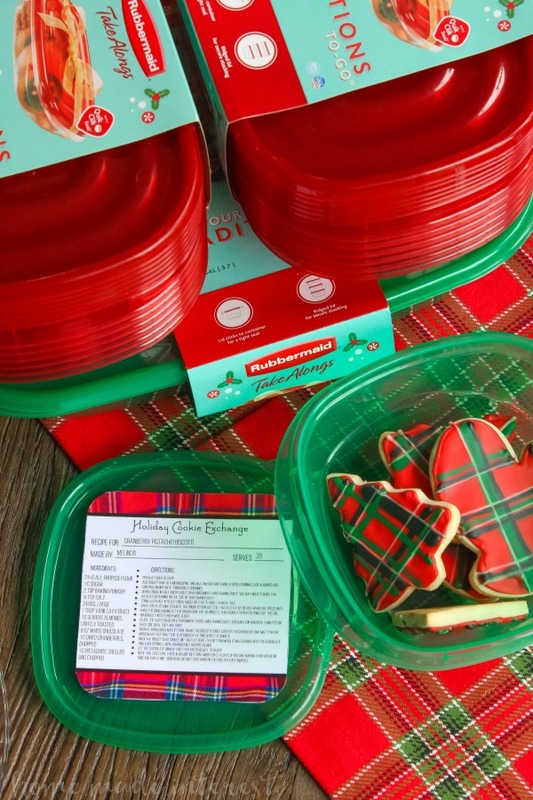 From now until December 24th you can find Holiday Rubbermaid TakeAlongs in limited edition red, green and prints for the holidays. 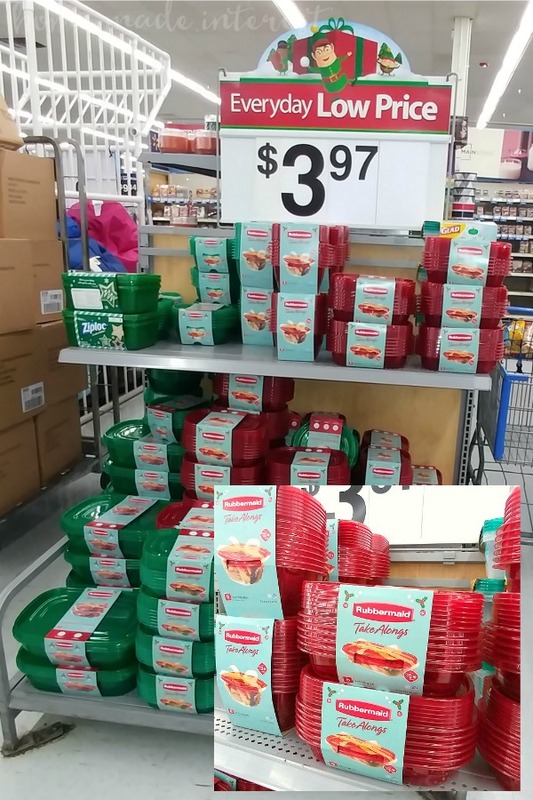 Make sure to stop by your local Walmart and pick up a few different sizes to store all of your goodies in over the holidays! Next Post » DIY Waterless Snow Globe and Snow Globe Cookies to Match! These cookies are too cute! I love how festive they are! !